I confess, I’m a restaurant review addict. 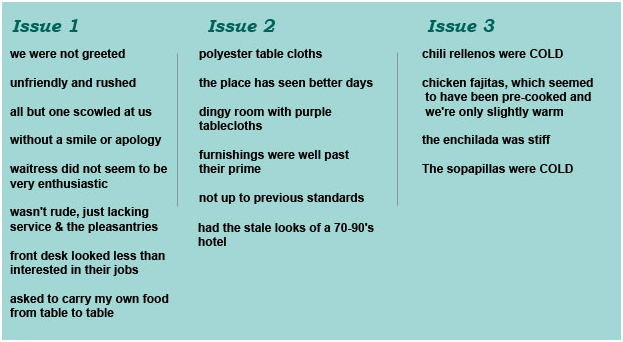 Weird as this may sound, I fritter away all kinds of free time reading the reviews of famous restaurants which I’ll probably never have the chance to visit. As a form of recreational reading material, reviews offer great drama, high hopes, crushing disappointments and glimpses of life that tell a story of big wins and big losses. In this post, I’ll show you how to mine reviews, organize data and turn those losses into wins. This process can work for any adequately-reviewed business, and Darren Shaw has kindly shared with me his master list of the top 10 most-reviewed industries. These numbers are the results of his analysis of 110 keywords in 294 cities, paginated through 10 pages (100 results per search term). That’s review data for 110 x 294 x 100 – or a total of 3,234,000 – businesses! Other runners-up that are abundantly reviewed? Catering, computer stores, cell phone repair, shopping centers, IT services, bed & breakfasts, air conditioning, apartment rentals and grocery stores. We’re going to scrutinize the reviews of 3 well-known American eateries, surface their most-cited problems and offer solutions. This is a process you can be used for almost any business that has earned a substantial number of reviews. 1) First, go to the major review sites for your clients and make a simple list of all negative sentiments from the past 3 years. Want to automate this step for a faster turnaround? Use a service like Review Trackers or Free Review Monitoring, pull the data into a spreadsheet and then use search and replace to isolate and count the incidence of specific sentiment. 2) Circle any negative sentiment that appeared 3 or more times in the last 3 years. 3) Discard any that appeared less than 3 times, unless the review in question makes an accusation of a hazardous or illegal situation. You might want to keep your discard list on file for your client, in case a less-cited issue is an emerging one instead of an isolated one. 4) Categorize complaints by type and make a final list for the client in an easy-to-read format. 5) Summarize your findings and recommend solutions. Let’s take a look at the final product. You have a 3.5 star average rating on Yelp and a 4.2 star average rating on Google. You have hundreds of positive reviews from customers who love your food and really enjoy the atmosphere of your restaurant, but three issues repeatedly surfaced in reviews from customers who weren’t satisfied with some aspects of their experience. These issues are: the high level of noise in the restaurant, the small size of the portions and an overuse of salt in various dishes. A few reviews also mention burnt food being served, but unless this continues to surface, the issue was likely isolated. Hold a meeting with the chefs and plan at least one new deluxe ‘hungry man’ menu item that will be more filling for extra hungry customers. Hold a meeting with the chefs to discuss quality control regarding the exact portions of salt to be used in each entrée. Be sure every chef knows the restaurant’s standardized recipes. Contact local contractors to discuss options for better soundproofing the restaurant to see if it would be feasible/affordable to make some changes to improve the acoustics. Once these 3 solutions have been investigated/implemented, please respond on pertinent reviews to let your customers know what you’ve done to address their problems they took time to report. Express gratitude for their suggestions and showcase your responsiveness. It will be up to the business owner to determine whether he or she wishes to act on your suggestions. Interest, dedication to customer service and budget will all play a part in their ability to respond. Some issues (like menu changes) can certainly be implemented, but others (like construction projects) may not be as easy to accomplish. At the very least, the owner has now been made aware of specific problems that could be preventing first-time diners from becoming loyal patrons. Your restaurant has an enviable 4 star average rating on Yelp which speaks very highly of customers’ experiences there. However, three specific problems are being repeatedly cited in reviews: wait staff is not friendly enough, food sometimes comes to the table cold and the décor is showing some wear. Hold monthly training meetings with entire wait staff for the next six months to review basic hospitality best practices. Emphasize cordial first greetings and attentive care throughout the dining experience. Incentivize improvements if necessary or consider new hires. Be sure all new hires are thoroughly trained in basic hospitality practices. Hold a meeting with kitchen staff to discover production line problems that are resulting in cold food. Are items being pre-made? Insist on fresh, hot food and develop a kitchen flowchart that ensures this. Hire a local designer to assess the current décor and develop an affordable refresh of table wares. New linens may be necessary, as well as new seat covers. Once these issues have been resolved, be sure to respond on the appropriate reviews to let your customers know you listened, cared and took action and that you hope they’ll visit again to experience the changes for themselves. The first two problems should be something any competent restaurant can solve. The third will depend on budget, but may really be worth the investment given that multiple reviews suggest that the place is beginning to look dated. Given the fact that Antoine’s is credited with creating and setting the historic standard of New Orleans cuisine, it hurts to see only a 3 star rating on Yelp and 3.7 stars on Google. Despite the many ecstatic reviews the establishment has received over the years, there seem to be three fundamental issues that need to be addressed: the current wait staff has not been trained up to the restaurant’s historic high standards, prices are often perceived as too high for the quality of food being served, and, there is a sense that Antoine’s is resting on its well-earned laurels by catering to tourists rather than winning local patron loyalty these days. We understand that Antoine’s has always offered an elite dining experience and that a proud bearing among the staff can actually lend to the mystique of an establishment, but in these days of instantly-shared social reviews, a reputation for rudeness and poor service isn’t a recipe for success. Hold monthly meetings with all wait staff to set standards for company culture and be sure every new hire is thoroughly trained in the menu. Fine diners expect to pay top prices, but numerous complaints of disappointment in actual food quality are creating an impression of a disconnect between what you charge and what you deliver. Antoine’s kitchen hires must ensure that all chefs are able to produce classic dishes in a masterful fashion. Hold bi-monthly cooking classes for the next six months in the kitchen to be sure every chef is capable of retaining his job. Make new hires if necessary. Our assessment of your reviews hint at an identity crisis for the business. Does Antoine’s need to rely mainly on tourists who may arrive in numbers but with unrealistic expectations of classic dishes and traditional service? Or, does Antoine’s want to bring back its original, local clientele to make up at least part of every meal served? If the latter, a social media and off-line media campaign should be developed, welcoming neighbors back to the restaurant with the regional cuisine, expertly prepared, that Antoine’s and New Orleans have made famous. I’m a sentimentalist, and can also get into the idea of historic places with eccentric staff and unusual dining experiences … provided the food is astoundingly good. 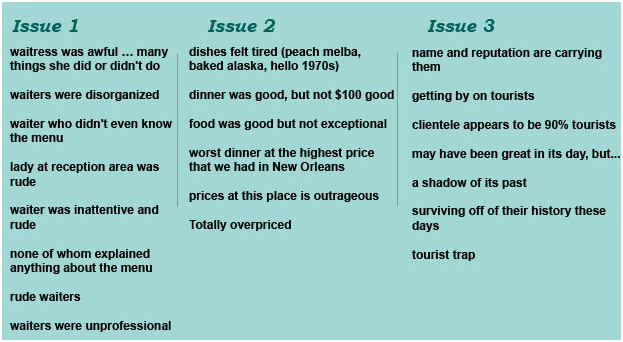 I think any agency tasked with marketing Antoine’s would quickly identify that there is a public perception that the place isn’t what it used to be, and the job at hand would be to attack that perception head on, making a superlative effort to correct cited issues with a deft hand. You’d have to dig deep to get to the heart of what’s going on here, and a place like this would deserve all of the creativity and care any agency could muster. For nearly a century, the Adolphus has offered a one-of-a-kind stay in the Lone Star State and many guests are completely thrilled with the history and architecture of the hotel. However, there are some critical issues – some of which would be considered illegal or hazardous – which are putting the business at grave risk. These issues relate to problems with: the valet staff, including accusations of theft, inadequately stocked and cleaned rooms, and outdated fixtures, including a dangerous situation with inadequate lighting. The Adolphus must absolutely contract with a new valet service and respond to every review containing an accusation of theft, aggression or negligence to let customers know that you have listened and engaged a new company. Given the illegal matters alleged in some of these complaints, we further recommend that you seek legal counsel regarding reported incidents to get professional guidance in resolving these matters with the current contractor and your past guests. The Adolphus must make every effort to resolve this as quickly as possible. Every guest has the right to expect a spotless room fully stocked with the usual amenities. There appears to be an on-going issue with missing towels, dirty beds and dirty floors. We recommend that a weekly class be given for the next 2 months to all cleaning staff to teach the exact standard of cleanliness to be carried out by all housekeeping team members. If employees fail to pass a cleanliness test at the end of this 8-week period, they must be replaced. Classes must be detailed, including how beds are to be made and refreshed, how floors are to be vacuumed, bathrooms cleaned and all surfaces dusted. Additionally, all house cleaning staff must be equipped with a print or digital checklist of every item that should be present in a readied room, including towels, soaps, etc. Finally, desk staff must be given a list of exactly whom to dispatch when new linens or amenities are requested so that such requests are honored promptly. Staff who fail to show adequate care in this regard, after appropriate training, should be replaced.We understand that the Adolphus is currently undergoing important renovations that should resolve some or all of the complaints of dated, broken or inadequate appointments in the rooms. These upgrades, when accomplished, should be highly publicized on the website, third party PR outlets and on the appropriate user reviews. It would be nice if the Adolphus would offer a second-stay-discount to some of its past guests who have been especially inconvenienced by outdated appointments. We highly recommend that reliable Wi-Fi and adequate power outlets form an integral part of the renovations, given the tech needs of the modern traveler. However, the paramount concern being cited in this category of complaints relates to inadequate lighting, which could lead to accidents and legal actions. As the renovations will likely take some time, we recommend that a temporary solution be found immediately. Speak with local contractors about installing at least one bright, temporary light in all bedrooms and bathrooms currently insufficiently lit. It could save guests from hospital trips and The Adolphus from litigation. It’s amazing how clear problems can become once you start organizing them. Your reviewers are doing more than half the work for you, by taking the time to list their complaints. All you have to do is bring these complaints into clear view and make your best suggestions for their resolution. Because I’m focusing mainly on restaurants here, I only looked at Yelp and Google+ Local. A full review audit will take into account whichever platforms are most pertinent to a client’s industry. In weighing the impact of negative sentiment, be sure you are also reading the positive reviews and noting their numbers vs. the number of negative reviews. After all, a business with 200 great reviews and 20 bad ones probably isn’t having a serious problem. A nice bonus for a client who is struggling might be to include a little chart highlighting what the business is doing well. If people repeatedly praise the ravioli, the courteous waiters or the lovely décor, it can help the client to know these are his strong points. Clients with few reviews, a good portion of which are negative, are in a bad situation. To me, such profiles always look as if the business were so awful, no one would go there after reading the bad reviews. Basic best practice here is to get a review acquisition strategy in place to outnumber the bad reviews with many more good ones. Consider a product like Reputation Builder if your client has few reviews. Pay attention to dates when auditing both positive and negative reviews. Old negative reviews followed by newer positive reviews indicate that problems may have been resolved, whereas a string of new negative reviews almost certainly indicates an emerging issue that needs to be addressed quickly. Your horse sense matters in review audits. If you read enough negative reviews, you should start to develop the ability to see the difference between reasonable and unreasonable complaints. All negative reviews should be taken seriously, but when they appear to stem from irrational expectations, they may frequently be disregarded after a careful read and, even, a further look into the reviewer’s personal track record of past negative reviews of other businesses. Review audits should be viewed as an on-going service, but probably not a monthly one. For smaller businesses, an annual audit will likely be sufficient, but for larger, more actively-reviewed companies, I’d suggest doing an audit of all new reviews twice a year to identify emerging problems. Review auditors are not lawyers or law enforcement officers. If reviews cite illegal or hazardous activity, don’t advise clients beyond telling them to contact authorities for steps to resolution. Negative reviews tell a story that can be painful for local business owners to listen to, but by cutting down clients’ workload with summarized lists and specific suggestions, you are giving them the means to write a better future for their businesses. Whether your clients are auto mechanics, dentists or tech companies, negative reviews are a gift, enabling us to hear the disappointment in a customer’s voice and, if the complaint is oft-voiced, to make absolutely specific changes that are pre-guaranteed to solve problems. Don’t forget the important step of encouraging your clients to make owner responses to negative reviews, once issues have been addressed internally. Often, you’ll want to help your clients craft these for best success. There will be considerable effort required to address complex problems and any business that makes those kinds of investments should view publicizing them as a reward at the end of the road. All in one owner response, a smart business owner can prove that he listens, cares, acts and runs the sort of business we’d all like to visit. Miriam is one of the sharpest local SEO's in the industry. She's a regular contributor on the Moz blog, and answers the toughest local search questions in the Moz Q&A. If your business could use a review audit like the ones she has outlined in this post, or any other local SEO work, we encourage you to get in touch with her through her website, Solas Web Design.